Many of William Hogarth's most famous pencil drawings and oil paintings can be found further down this page as well as discussion about the full path of his career and how it helped to influence the overall direction and success of British art within the 18th century, and beyond. 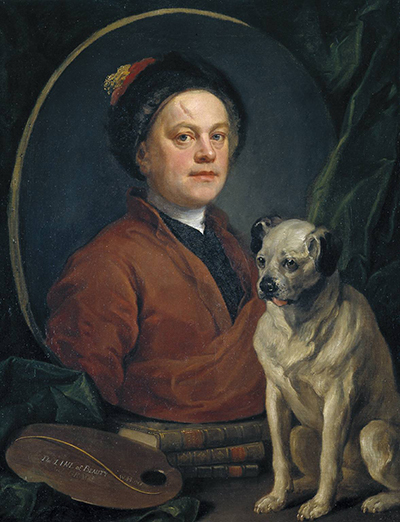 The success of William Hogarth can be seen in the modern day by the art galleries and museums which now hold and display his art work all year old. All of his significant paintings and drawings can be found in some of the most important and impressive art galleries and museums around of the world, with British galleries most frequently holding his career highlights. Within London, galleries such as the Tate Britain place him alongside other great artists from the UK such as John Constable, JMW Turner, Thomas Gainsborough and Joshua Reynolds. William Hogarth is generally seen as the first artist to produce sequences of related art works which has since become common place in the careers of so many prolific artists across many countries and art movements. Claude Monet created his Haystacks series which was carefully presented as a sequential series and it was actually William Hogarth who first came up with the idea, as seen in The Four Stages of Cruelty and Marriage à-la-mode. Gin Lane and Beer Street are amongst the best known prints from William Hogarth and were a sign of the artist's satirical and symbolic art works, with these specifically addressing the topic of alcoholism and presenting it in a realistically saddening mood. These two prints came about in 1751 at a time when clearly the artist was generally concerned about society's ills and how they had led to such a situation of alcohol abuse. Beer Street and Gin Lane were sequential engraving prints which served to underline the effects of drinking British beer against Gin, with the two works offering highly contrasting after effects from the two different drinks. In a rare sign of the importance of art politically, the Gin Lane art work was published to support the later Gin Act of 1751 which shows the strength of Hogarth as an artist within his own lifetime when most significant artists only achieve academic acceptance and significant prominence after their careers and lives have finished. Beer Street offers British beer in an exceptional light, and something of a healthy choice as opposed to Gin as features in Gin Lane. It is incredible to see an artist getting so involved in political debate, and producing what can essentially be called propaganda, when this was so uncommon in the mid-18th century. Hogarth may not be the best known artist in British history, but he certainly left a considerable legacy which is seen in other major artists that are themselves exceptionally well known. Beer Street and Gin Lane of 1751 have grown to become the best known engravings from the career of William Hogarth and were a politically motivated series of art works which was joined by his friend, Henry Fielding's An Inquiry into the Late Increase in Robbers. These publications helped to signal the true beginning of satire and the rise of art which was not simply a happy depiction of whatever was fashionable within each period. Please see below for a summarised list of the best Hogarth paintings that are featured throughout this website.